Welcome to the Haivision™ InfoCenter! The Welcome to the Haivision™ InfoCenter! topic for version does not exist. Would you like to go to the home page of version instead? The InfoCenter puts the user documentation for configuring and managing your Haivision products at your fingertips. Always check here for the latest information available. See How to use the InfoCenter and other helpful topics listed in the sidebar for tips and tricks on finding the information you need. Time-shifted HD streaming for multi-site worship, scaleable to an unlimited number of remote locations. An enterprise-grade digital signage system, offering advanced content management, scheduling and dynamic data capabilities. 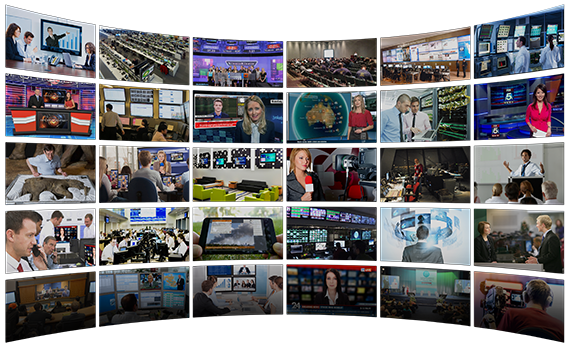 A complete ecosystem to deliver broadcast channels and internal content to every screen throughout a facility. Cross-platform utility that allows for the launching of a desktop application from a Haivision product to the user’s desktop. Video content manager connecting your audiences to live and on-demand HD video wherever they are, on any device. H.264, HEVC, and 4K encoder/transcoder, on-premise or in the cloud, for internet streaming. High performance, real-time H.264/HEVC video transcoder with metadata for low bandwidth DVB stream distribution and ISR applications. Unique match for the Makito X encoder, capable of decoding H.264 and HEVC streams with extremely low latency. Transports secure, low latency, H.264/HEVC video over any network at extremely low bitrates. Bridge networks with stream conversion and distribute video to multiple destinations. Organize, manage and share secure, high quality live and on-demand video for global enterprise events, facility IPTV and research recording. Stream and play back content with your mobile device. Haivision offers various STBs to match your needs.